Palestinian female Olympian: 'Miracles do happen' - Integration Through Media ....! By Matthew Chance and Caroline Cheese, CNN: Woroud Sawalha knows she won’t win a medal at the London Olympics. She isn’t likely to get beyond the first round of the 800 meters. But for the 20-year-old and her three teammates, just competing under the Palestinian flag is a source of pride. The appearance itself is controversial: the U.N. does not recognize a Palestinian state but athletes have been allowed to compete under a Palestinian flag by the International Olympic Committee and soccer’s ruling body FIFA since 1996 and 1998 respectively. Asira ash-Shamaliya is a village of fewer than 10,000 inhabitants in the northern West Bank, where protests and tear gas form part of everyday life in a region still fighting for independence from Israel after two decades of struggle. The International Olympic Committee is hopeful that the 2012 Games will be the first to feature female athletes on every team. Three teams have never sent women. Palestinians have competed in the Olympics under their flag since 1996, sending their first female athlete in 2000. 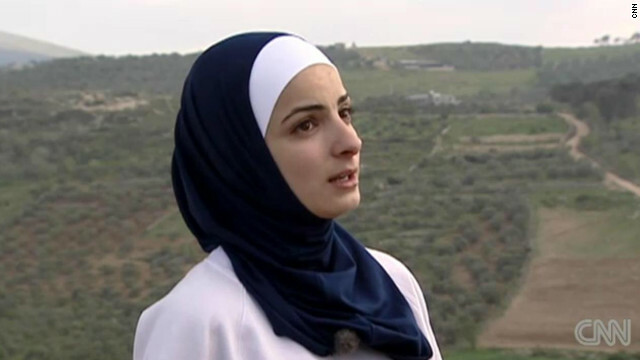 However, Sawalha believes the fact that she was only told six months ago that she would be going to London is a sign of how lightly women’s sport is taken in the Palestinian territories. She had her first taste of top-level international competition earlier this year at the world indoor championships in Istanbul. She clocked two minutes 51.87 seconds in her heat for a personal best that was still more than 53 seconds slower than the gold medal-winning time. Given her lack of preparation and the scant training resources available in her homeland, Sawalha knows a medal is beyond her, so her target is to further improve her personal best. Training on pot-holed roads in Gaza, dodging cars and horses and carts, Bahaa al-Farra knows that only so much improvement is possible. Like Sawalha, the 400-meter runner must rely on an invitation from the IOC to compete in London because neither has reached the required qualifying standard. So when he arrives in London, he’ll not only have the daunting prospect of a first Olympic Games to consider but he’ll also have to quickly get accustomed to unfamiliar conditions. “Hopefully, the lack of training tools won’t affect me, and I can prove to the world that we can compete even without them,” he said. For al-Farra, competing in London won’t leave him completely fulfilled. He hopes it is only the start of a long athletics career. “My dream is to become a world-known runner and compete with world champions in overseas competitions and hopefully I can achieve my dream in the near future,” he said.